A Hong Kong-based company is investing US$164 million (HK$1.28 billion) to build a biodiesel plant to produce 100,000 tonnes of fuel each year. “As a clean, alternative transport fuel made from waste, our biodiesel has the potential to make a valuable contribution to improving Hong Kong’s environment,” ASB Biodiesel chief executive Anthony Dixon said yesterday. Dixon said emissions of greenhouse gases from biodiesel are 85 percent less than those of fossil diesel. Widespread use of biofuel has sparked controversy, with opponents seeking to taint the diversion of crop supplies toward biofuel production as disastrous for food supply. Dixon said the problem may be overcome by producing biofuel from waste. He also said rising food prices will have little impact on production costs. Noting that local demand for biodiesel currently stands at 70,000 tonnes a year, Dixon urged the government to provide more support for producers. He said the fuel his firm produces will be distributed to local petrochemical and oil companies, as well as the international marketplace. Construction of ASB Biodiesel’s plant – located on an 18,000-square-meter site in Tseung Kwan O Industrial Estate – will be completed in December 2012, with production starting in 2013. Greeners Action executive director Angus Ho Hong-wai said biodiesel use can reduce our dependence on fossil diesel, which generates large amounts of air pollutants, such as sulfur dioxide. Ho suggested the government offer incentives, such as providing land, for producers to build their plants. There are currently three biodiesel production plants in the territory. In order to promote the use of biodiesel locally, motor vehicle biodiesel is duty-free. The unsightly black smoke that pours from ferries as they churn across the harbour tells much about the Hong Kong government’s approach to air pollution. It is a clear sign of the need for greater urgency. Such emissions are from another era, an age when the world had little concern for the environment. Visitors look at the pall and in an instant think our city is out of step with global concerns about climate change, sustainability and public health. This is not the case, of course. Lawmakers are only too aware of what they should be doing to clean our air. The Environmental Protection Department is staffed with highly skilled officers who are not short of facts, figures and solutions. What is holding up action is an unelected government under pressure from interest groups: in this instance, ferry companies. A government with a popular mandate could quickly fix the problem by making it law that ferry operators use clean diesel to fuel their craft. There is no reason why our leaders could not also do the same in the name of the common good. We must remember, though, that the companies have been hit hard by the economic crisis and unstable fuel prices. Any move to get them to switch has to involve cajoling, convincing, incentives and help with infrastructure. The nine-month trial of ultra-low-sulphur diesel involving three ferry companies announced yesterday fits with such a strategy. Passing it off as a technical and economic feasibility study lays the groundwork. The best locations for refuelling depots can be determined during the trial. From the initial five ferries, the programme can be broadened. During the nine months, the benefits that are already so obvious will be made plain to the ferry industry. The environmental benefits of electric cars are denounced as “fiction” by new research into green methods of transport. The amount of energy used by coal fired power stations to create the electricity to recharge electric vehicles makes them half as efficient as diesel cars, according to the research. Britain’s carbon emissions could even go up if there is a sudden surge in demand for electric cars, the new research warned. It will call into question a £250 million government scheme announced last week offering consumers £5,000 subsidies to buy a new electric car. The research conducted by the group Transport Watch found that diesel powered vehicles emit approximately half as much CO2 as electric cars when the use of fossil fuels to produce electricity is taken into account. Factors making the rechargeable cars less efficient include the amount of electricity lost on the journey between the coal fired power stations which generate it and the point where it recharges the car, and the energy lost by the batteries and the motor. 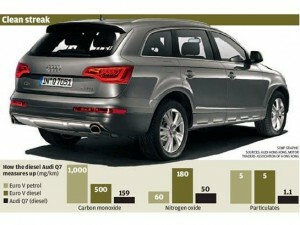 A modern diesel engine, by contrast, achieves 45% efficiency. The research suggests that if fossil fuels are to be burned, it is much more efficient to do it within the engine of a vehicle rather than at a power station and then try to send it via the National Grid, where a lot of energy is wasted, and finally to store it in a battery which in itself might leak power. Currently the bulk of the electricity used to charge the batteries of electric vehicles is generated by fossil fuel burning power stations. Only 20% of UK electricity is generated by ‘clean’ methods such as nuclear power. The research by Paul Withrington of Transport Watch concludes that CO2 emissions could actually go up if there is suddenly a big demand for electricity to recharge batteries as it would have to come from existing fossil fuel power stations. He calculated that in China, where most generation of electricity is coal fired, electrification of diesel powered transport would double the emissions from that sector. There are also big financial and environmental costs involved in setting up a battery charging network. The Government’s plans have also drawn criticism from motoring groups. The RAC has also questioned where the Government derived its £5,000 incentive per vehicle figure, when previous grants to buy electric cars have been £1,000.